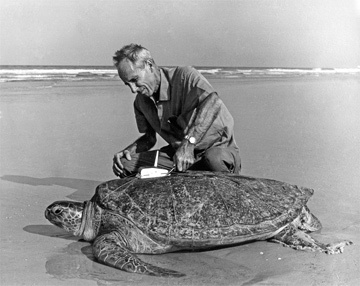 The Carr Medal honors the late Archie Carr, University of Florida zoology professor and world authority on sea turtles. The medal recognizes outstanding national and international contributions to the knowledge, understanding and appreciation of our natural heritage. Archie Carr was passionate about conservation, especially for sea turtles. Archie F. Carr has been revered for his efforts to make known the plight of large sea turtles around the world. Carr received his Ph.D. from the University of Florida in Biology in 1937 and immediately joined the UF faculty in the Biology Department. It was at UF where he began a career that would propel him into notoriety as an internationally acclaimed zoologist, historian and conservationist. Throughout the 1940s and 50s he initiated international life history studies on sea turtles throughout Central and South America, Caribbean, Europe, Africa and Australia. These groundbreaking studies led to the rise of a major conservation movement and many of Carr’s programs are still active today. He received many accolades for his conservation efforts over the course of his career including the Gold Medal from the World Wildlife Fund in 1973, the Edward W. Browning Award in 1975 and New York Zoological Society Gold Medal in 1978. His legacy includes the Archie Carr Center for Sea Turtle Research at the University of Florida, the Archie Carr National Wildlife Refuge along Florida’s east coast in Brevard and Indian River counties, the Dr. Archie Carr Wildlife Refuge in Costa Rica, and the Sea Turtle Conservancy, the world’s oldest and most accomplished sea turtle organization. 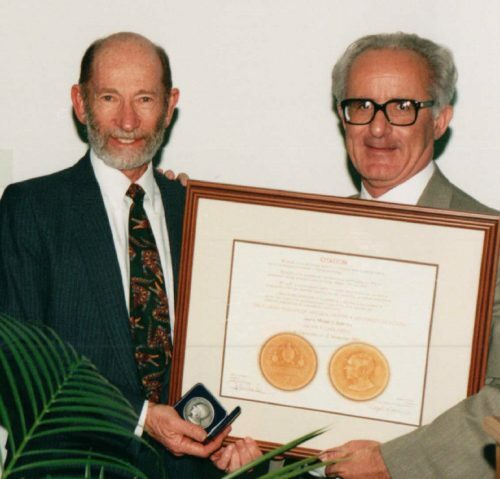 Michael E. Soule was presented with the Carr Medal in 1997 by then-UF President John Lombardi. It is in Archie Carr’s spirit of dedication and excellence in the biological sciences that the Archie F. Carr Medal is awarded. Created by the Florida Museum of Natural History in 1979, the medal honors others who, like Carr, have been nationally and internationally recognized for their contributions to an understanding of our natural heritage. Recipients are chosen by a national jury of respected leaders in the sciences across the nation appointed by the Director of the Florida Museum of Natural History.